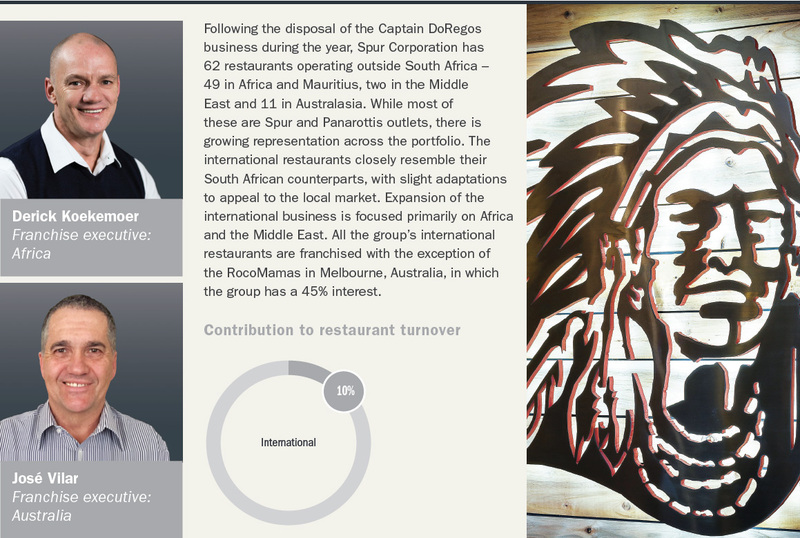 Excluding Captain DoRegos, international restaurant sales decreased slightly by 0.7% to R711.5 million (2017: R716.4 million). At constant exchange rates, international restaurant sales increased by 2.7%. Trading in Australia and New Zealand is down on the previous year, with total franchise restaurant sales down by 19.4% on the previous year (16.9% on a comparable exchange rate basis). 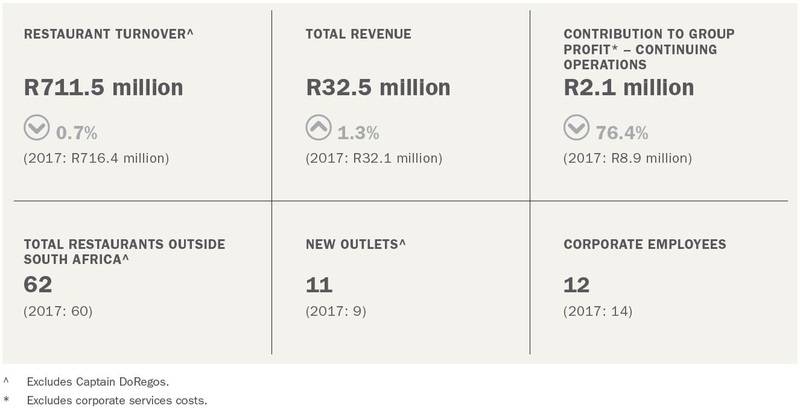 Turnover was negatively impacted by the closure of two Panarottis outlets in December 2017 and January 2018. Turnover in Western Australia has been particularly disappointing, mainly attributable to the collapse of the mining sector and high unemployment. These factors have negatively impacted foot traffic to our restaurants. Our main challenge in both Australia and New Zealand remains the high cost of labour. This results in a need to support franchisees through contributions to marketing efforts, franchise fee concessions and product subsidies, negatively impacting profitability. Management is therefore continuously challenged to find ways to ensure the ongoing provision of high-quality service while keeping labour costs low. We are maintaining assertive marketing campaigns in all areas to boost consumer appeal. As each restaurant in Australia has its own customer base, we are focused on local marketing initiatives. 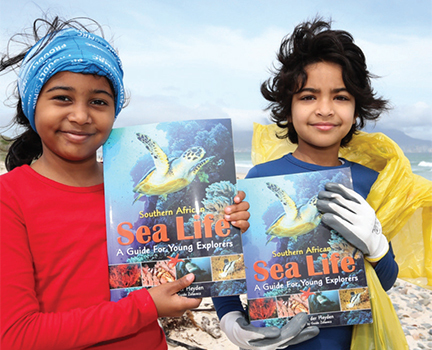 We have introduced a schedule of weekly promotions as well as children’s entertainment and meals. Several restaurants are trialling Uber Eats as an additional source of reliable revenue. Our franchisees are leveraging social media to broadcast local specials and discount offerings. Locally generated content enables franchisees to tailor their social media engagements and marketing material specifically for their customers. The first RocoMamas outlet opened in Australia during the year, in Melbourne. The brand has been modified to appeal to the local consumer. The small restaurant size, and limited menu offering differentiate the brand from the Spurs and Panarottis trading in Australia, and should provide a compelling investment proposition for prospective franchisees. Total franchised restaurant sales in Africa, Mauritius and the Middle East grew by 9.6% (13.5% on a comparable exchange rate basis). 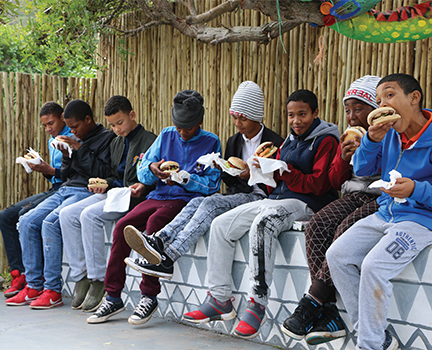 The group opened a John Dory’s and a Panarottis in Namibia, two Panarottis and one Spur Grill & Go in Mauritius, a Panarottis and a Spur in Nigeria, a RocoMamas in Zimbabwe and Kenya, and a Spur in Swaziland. The group has invested significant resources in adjusting the traditional Spur model of large footprint restaurants to smaller units that include terrace areas. This smaller look and feel Spur has been well received. It has delivered improved operating margins, reduced set-up costs and an increased return on investment for franchisees. 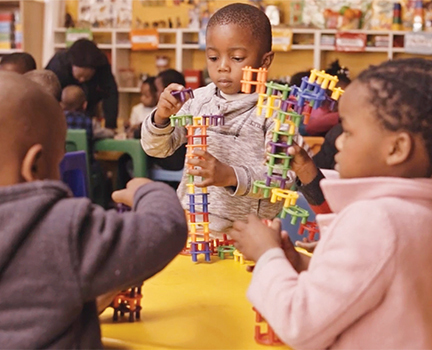 This model is being rolled out in the African market to other brands within our portfolio, backed by continued progress in enhancing our supply and logistics network throughout the continent. This will help us develop improved quality and consistency of product. 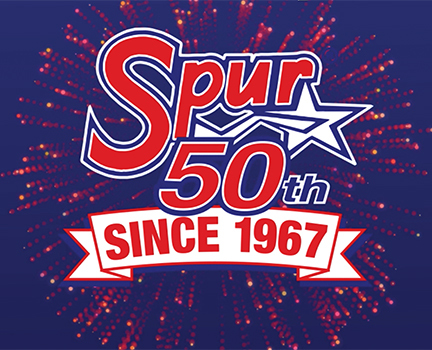 The Spur Loyalty programme is currently running in seven countries, with a further three launches planned for the 2019 financial year. The Go Review customer satisfaction tool is being rolled out in all countries and for all brands. We are actively pursuing expansion in Saudi Arabia and are investigating opportunities to expand our brand portfolio into other parts of the Middle East region.